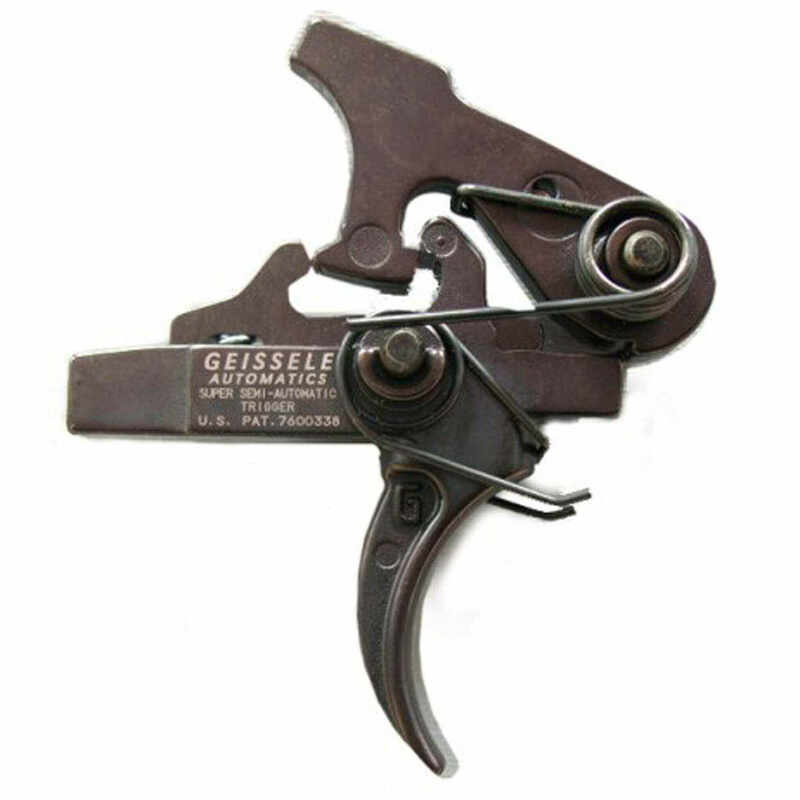 The Geissele Super Semi-Automatic (SSA®) trigger is a semi-automatic-only version of the Super Select-Fire trigger that Geissele Automatics developed for the U.S. Special Operations Community. It has a pull weight of about 4.5lb – 2.5 lbs on the first stage and 2lb on the second stage. The pull weights and sear engagement are non-adjustable by the shooter. Trigger and hammer are made from quality tool steel. The Geissele SSA trigger allows the shooter to slap through the trigger pull on close in shots but also set up a long range shot with a crisp trigger break. A full force hammer spring is used for quick locktime and positive ignition of all types of ammo. There is no lightened hammer spring used. Easy to install – the SSA is a simple design that is very similar to the original M16 trigger. The number of parts is identical. Hammer and trigger pins are a close slip fit into nominal receiver holes so the trigger can be installed and removed withrudimentary tools. The Geissele SSA has a patented pseudo sear that is almost identical to the standard AR15 single stage sear. However, this secondary sear has surfaces that never touch during normal operation. This sear prevents the hammer from falling unless the trigger is pulled. The secondary safety sear contributes to shooter confidence in dynamic/vehicle situations where a fellow shooter’s muzzle may cover position the weapon can never discharge unless the trigger is pulled. Does not fit HK416 weapons with firing pin safety. Great upgrade for the X95.....trigger is so smooth and breaks just when it should. Highly recommended. Lightening fast delivery....thanks AT3! Fast delivery! All parts included. Watched two YouTube videos on install process. Had original out new one in about 15 minutes! Pay attention to videos and supplied paper instructions and there shouldn't be any problem. Can't wait to shoot with new trigger install. The trigger group went in very easy and I went out and tried it afterwards and it worked great. I am very satisfied with the trigger. I can't be happier with spending the money on this superior product! Smooth as butter...immediately reduced groups. Nice reset. First time purchase from AT3 Tactical...won't be the last! Quick Service!